Woody Howard was to the point of looking for a real job. Then, he found one. But it just happens that Howard’s job will be what he really wanted it to be—driving a racecar. But the phone didn’t stop ringing and the good news didn’t end there for Howard. 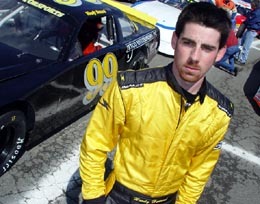 Following in the footsteps of former South Boston competitor, Denny Hamlin, Howard was contacted by Joe Gibbs Racing and signed to a driver development deal. 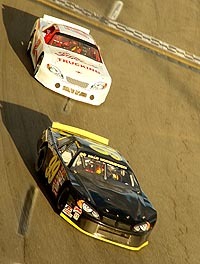 After being a prominent fixture in the Late Model Stock scene over the past four seasons, Howard’s future was uncertain coming into 2005. Unable to keep his family-run team going, Howard was facing having to park the familiar yellow No. 30 car when the phone rang, not once, but twice. Legendary car owner Jim Dean, who fielded Late Model Stock cars for Mark McFarland and Denny Hamlin in recent years, called first, offering the Chesapeake, Va., driver a chance to drive for his newly-formed Hooters Pro Cup team. "Jim Dean called up and asked if I’d be interested in running some Hooters Pro Cup races with him," said Howard. "It was getting to the point where we couldn’t run our own team anymore in Late Models, and [Dean] wanted me to start running some Hooters Pro Cup races for him." "It’s a dream come true," said Howard. "Everything has happened so quick, it really hasn’t set in yet. All the details still haven’t been finalized yet, but I’m finally getting paid to drive a racecar." Howard will try to earn his paycheck this weekend when he enters the Greased Lighting 250 at South Boston Speedway. In preparation for his Pro Cup debut, Howard, who won South Boston’s season finale, Virginia is for Lovers 300, last season, was on hand for Monday’s Pro Cup test session at his home track. "The Pro Cup cars are really fun to drive," said Howard, who will pilot the No. 55 Dean Motorsports Chevrolet at SoBo. "The speeds are about what we turned in the Late Models, so speed shouldn’t be an issue. The cars definitely drive different, but I don’t think it will take that long for me to pick up on it." Making his first start at a track he’s familiar with may ease the transition as well. Howard is now driving the famous #99 in the Late Model Stock world. "I think [being a regular at South Boston] is going to help," said Howard. "There are a lot of Pro Cup guys that are really good at South Boston, but I don’t think it’s too farfetched to think we could run in the top five." If Dean Motorsports is able to secure sponsorship for its Pro Cup effort, Howard plans to run the entire Northern Division season. In addition to his Pro Cup schedule, Howard will start testing a Joe Gibbs’ Busch car and possibly make selected Craftsman Truck Series starts for JGR in 2005.